This card is again part of my Birthday Card Kit Class I had offered. These are 2 cards designed for girl. 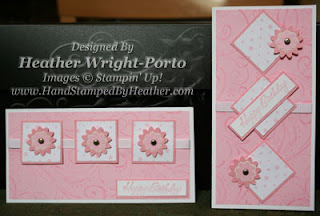 It is a double layout and is CASED from a card displayed in the July Stampin' Success magazine from Stampin' Up! Some of the ladies at my workshop did this card in Pale Plum with the retired Encarte Designer Series Paper. It looked just as pretty! Using the Boho Blossoms Punch, punch 5 times in Berry Bliss Designer Series Paper, and 5 times in Pretty In Pink. These will be used to create the 5 flowers you see. The small flowers are adhered to the larger flower with SNAIL adhesive. Then use the handheld punch to punch a hole in the middle of each and place a silver brad. Punch 6 sets of squares: 6 in Pretty in Pink (1-3/8) and 6 in Berry Bliss pink dotted paper (1-1/4). Adhere the small square on top of the large pink square using SNAIL adhesive. Outline the small flowers with the white gel pen. Adhere flowers to square using Dimensionals. Wrap ribbon around cardstock (pink cardstock). Adhere pink cardstock to Whisper White card front. if you are one of my existing customers.